Presentation Zen: It just depends: Should you "go analog" or "go digital"? When I was an employee with Sumitomo in the mid-90s, I discovered that Japanese business people often used the term "case-by-case" when discussing details of future events or strategy. This used to frustrate me since I was used to more concrete plans and absolutes and making decisions rather quickly. I learned, though, that context, circumstance, and a kind of "particularism" was very important to the Japanese I worked with. Today, I might use Japanese expressions like jyou kyou ni yotte (judgment depends on circumstance) or tokito baaini totte tsukaiwareru (use depends on time and circumstance) when discussing what techniques or equipment to use for a particular presentation. I used to think that "it depends" was a weak statement, a copout of sorts. Now I see that it's smart. Because...it really does "all depend" on the unique context and circumstance found in each situation. What tools or techniques you use to make your presentation depends on a great many things, of course. Often the best "PowerPoint presentation" is the one you never give. Slides and projectors/displays are good tools for many kinds of presentations, but by no means are they appropriate for all situations. Often it is more appropriate (and refreshing) to go completely "analog." Last week I attended a good example of an "analog" presentation. 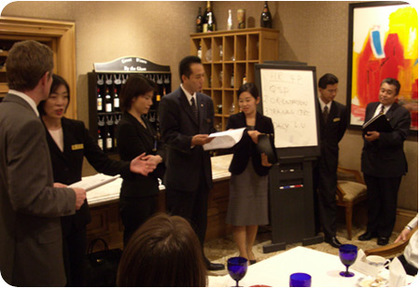 My friend, Ricco Deblank, General Manager of the Ritz-Carlton Osaka — the most preferred hotel employer in Japan — invited my HRM class into the hotel for a short seminar and a behind-the-scenes look at the Ritz-Carlton brand and a peak at what makes it so special. There were about twenty-five in our group. Ricco is a very engaging figure and passionately believes in his message. For this particular situation, I think slides could have taken away from the message. 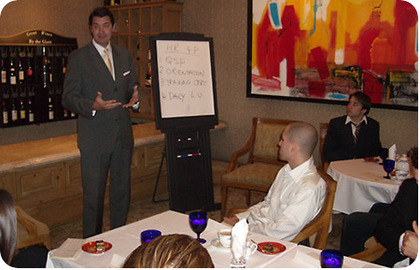 The only visuals used (besides the Ritz-Carlton Hotel itself) were a flipchart/pens and the Ritz-Carlton Credo. The Credo, a small card which every employee carries with them, contains 20 important principles that are the heart and soul of the Ritz-Carlton promise. Each audience member received the credo and could refer to it as Ricco called attention to particular sections of the card. The Credo also served as a great takeaway. Above: Ricco Deblank, Ritz-Carlton GM, goes "low-tech" and gives an impassioned presentation on why it's the employees that make the Ritz so special. 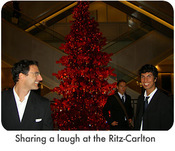 Above: Ritz-Carlton executives and front-line managers demonstrate the "line up" and act out a few scenarios. Present "digital" and plan "analog"? So sometimes (often times?) presenting without the aid of slideware is appropriate and desirable. But what about planning a presentation that will be delivered with the aid of slideware? Even if you are going to make an important presentation with the aid of slideware, I still think it is important to "go analog" in the early stages. I am not a big fan of planning a presentation on the computer. We are so glued to these machines (Macs and PCs) and the software (Office, Keynote, S5, etc.) that I often wonder if Tufte is right — maybe there is a "Cognitive style" to the software itself that that affects even our best intentions and brightest ideas. Peter Drucker:"The computer is a moron"
The planning stage should be the time when our minds are clearest and all barriers removed. I love technology, and I think slideware can be very effective in many situations. But for planning, I say "go analog" — paper and pen, white boards, a note pad in your pocket as you take a walk down the beach with your dog...whatever works for you. Peter Drucker said it best: "The computer is a moron." You and your ideas (and your audience) are all that matter. So try getting away from the computer in the early stages, the time when your creativity is needed most. For me at least, clarity of thinking and a generation of ideas come when my computer and I are far apart. Walks on the beach are my greatest source of inspiration and clarity. Would love to hear your examples of "going analog" for the presentation or in the planning stages (or both). I had some success recently when I wanted the audience to follow the steps of a process which is actually very simple, but the resulting diagram makes it look more complex than it is. I said up front that I was going to "take them away from the projector for a minute"; then went ahead and talked them through the process while drawing the diagrams on a whiteboard. Seeing the procedure take shape (even in my writing ;)) seemed to help it come together. >then went ahead and talked them through the process while drawing the diagrams on a whiteboard. Thanks, Ben. Yes, even if you use a projector, hitting the B or W key and then moving to the whiteboard can be a nice change up (at the very least). There's just something very visceral and clear about drawing and explaining in front of an audience on a whiteboard flipchart, etc. my favourite presentations (that i give) are when i'm telling the story with illustrations i make on the spot on the whiteboard. i find slides cramp my storytelling, no matter what. hmmm, i need to try the background image thing you guys all rage about. love the site. hooked on it. I worked with an art director when I was at Apple that was an amazing "analog" guy. He kept sticky notes all over his beautiful cinema display and almost *never* used his Mac at all. For his presentations, he would put huge sheets of paper on the wall to show his beautifully drawn "steams of consciousness." He could draw on the fly too as he thought out loud. It was fascinating and effective. I would do that if I could — but I draw like a 3-year old (which may actually be insulting to 3-year olds...). Anyway, yes, if you can do it. "Live" illustrating can be excellent for story telling. You are absolutely right. Using computers in creatve processes is often more a barrier than a needfull thing. Ideas have to appear clearly and unformed by any technology. So I prefer using pen and paper in every process of developing new ideas. Its fast, its adaptable to many ways the mind will travel and you can use it nearly everytime and everywhere. at time 19:58 to see a good development of ideas visually. Analog is not the only alternative here. there are other types off software that allow a much more open ended use. We have taken to using tablet PC's and mind mapping software or some completely freehand "whiteboard" application. A major reason that the slideware hits walls sometimes is because it is just too linear and not interactive enough. Nice blog. keep up the good work. i sure will regularly be coming back. You can check out my blog Solomon's voip world devoted to voip technology and internet telephony. I have been wanting to have 2 separate displays on the laptop and projector (during a presentation). It would be nice if my laptop has a "Previous - Now - Next" slide up on it at the same time so that I can talk ahead. While the projector has the slideshow going on. But I never have that much time. The best presentations I have seen are when the presenter talks something interesting and then validates his statements by some statistics/pictures/video by 'showing the next slide'. I have tried to overcome this by having printouts with me but it hasn't worked well. I'm curious Garr. Do you go analog or digital for your datebook/to dos and daily organization? I agree that one has to be very careful not to go always digital if its not better than analog. Since reading Tufte I've been paying attention to this and have found that many thought processes are dumbed down when going completely digital. >I'm curious Garr. Do you go analog or digital for your datebook/to dos and daily organization? Funny that you mention that, Juan. Yes, I do use an old filophax rather than a PDA. I bought a PDA (Handspring) when I was at Apple, but never really used it since I had "my whole life" so to speak on my PowerBook that I took everywhere (I ended up giving the PDA to someone). All phone numbers where in my cell phone. The PDA just never made it for me -- it was (is?) one of those technologies that you *really* love or you *really* don't get. Thanks Garr. I've been switching using a PDA and paper based system, comparing results. It seems I have a better "global picture" with paper. have you ever tried working with Presenter View in PowerPoint? MS adds an interface on your laptop screen, while sending slide show mode out to the projector. You'll need to have the second display hooked up, and when you do, go under Slide Show > Set up Show. Look for the section called Multiple Monitors. Man, the last image of this post is SO beautiful! Congrats. Are these beaches from japan? I completely agree! When involved in the "discovery" part of a project, I love ditching my Powerbook and opening my notebook. Quick scrawlings on paper are great to get an idea of how something will work before it's built. I've seen all kinds of software that claims to aid in brainstorming, but all I can think about is how much easier it would be to do it in pen first. Such a hassle. And, of course, walking to work and back helps me relax my mind. Sometimes silence is an even better companion than an pen or a computer.